Product #1220 | SKU EFS60 | 0.0 (no ratings yet) Thanks for your rating! 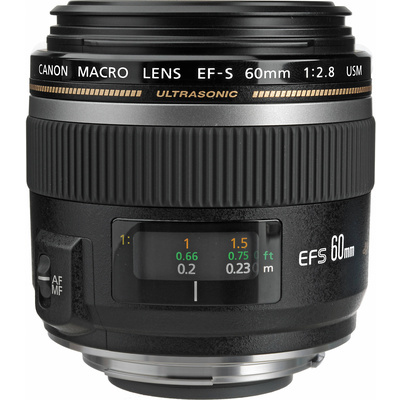 Mixing a comfortable short telephoto focal length with optimised close-up capabilities, the EF-S 60mm f/2.8 Macro USM from Canon is an EF-S-mount prime designed for APS-C-format DSLRs. As a true macro optic, this lens affords a life-size 1:1 maximum magnification along with a 20 cm minimum focusing distance, and its 96mm equivalent focal length also makes it an ideal option for portraiture. The optical design affords a high degree of sharpness and resolution across the image frame and individual elements have been treated with a Super Spectra coating to minimise lens flare and ghosting for greater contrast and colour accuracy when working in strong lighting conditions. The lens also employs an Ultrasonic Motor along with an internal focusing design to realise quick, quiet, and precise autofocus performance as well as full-time manual focus override. Ideal for macro shooting, this lens offers a life-size 1:1 maximum magnification along with a minimum focusing distance of 20 cm to suit working with close-up subjects.